Naturals (Minimally processed, no artificial ingredients). 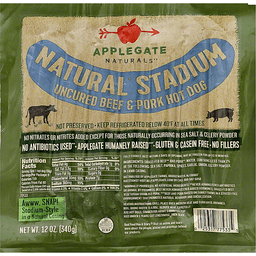 No nitrates or nitrites added except for those naturally occurring in sea salt & celery powder. No antibiotics used (Never administered antibiotics or animal by-products. Beef never administered added hormones. Grass-fed beef. Vegetarian grain-fed pork). Applegate humanely raised (Beef and pork raised on family farms in a stress-free environment that promotes natural behavior and socialization). Gluten & casein free. No fillers. Awww, snap! Stadium-style in a natural casing. US inspected and passed by Department of Agriculture. Fully cooked. Real food has a story. Visit us online and learn more about the people, places and practices behind our products.